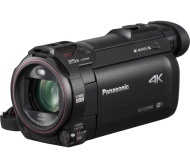 alaTest heeft 27 reviews verzameld en geanalyseerd voor PANASONIC HC-VXF990EBK 4K Ultra HD Camcorder - Black. De gemiddelde beoordeling voor dit product is 4.4/5, vergeleken met een gemiddelde beoordeling van 4.0/5 voor andere Camcorders. Gebruikers waarderen het gebruiksgemak zeer maar velen zijn minder positief over de betrouwbaarheid. De zoeker is ook indrukwekkend. We hebben de consumenten- en expertbeoordelingen, de leeftijd van het product en andere factoren geanalyseerd. Vergeleken met andere Camcorders krijgt de PANASONIC HC-VXF990EBK 4K Ultra HD Camcorder - Black een alaScore™ van 89/100 = Zeer goed. It has an eye-piece, so you can actually see what you are filming. You can't down load to any PC unless it is running Windows 10; you need a 64Gb memory card (16Gb holds less than 10min); and a bigger battery (the one supplied will film for about an hour, in total - I filmed tennis at Eastbourne). I have a Nikon dslr and did not use it as the Panasonic still pictures were every bit as good as a dslr. I loved the ease of use. Amazing camera, fantastic quality picture and zoom. Would recommend to any aspiring videographer. A little small to use as a professional camera. Lightweight and fits into your pocket easily. Good quality and easy to use, with many features i have yet to fully check out. Love how you get great 4K still shots from your film footage. The small visible area when using the viewfinder. Accurate autofocus and the image stabiliser is probably the best on any consumer camcorder. Good viewfinder alternative to the LCD screen. Manual overrides add to the flexibility. Very good evf, which was the main reason for purchase as the Panasonic camcorder I already own could be difficult to use in bright sunlight. For an expensive camcorder the build quality didn't seem very substantial, especially the cover over the accessory shoe. Only prolonged use will tell whether the camcorder stands up to reasonable wear and tear. Picture quality in 4k is very good, and I like the preset zoom button for steady zoom control. Sound quality not very good to match the 4k picture quality. You have to invest in a quality external mic. Not enough preset zoom speeds, only two on offer. light and easy to use, looked a quality product, and had all the cables needed to do a good job, usb, charging, hdmi. good eye piece for shape and cutting out the distracting sidelight.